Gratitude Art launch at Bookworld España | Marbella Marbella – Adelante! Gratitude Art is the brainchild of local company director, and aficionado of self-development, Line Lyster, Redline Company, who creates a range of gifts, canvases, greetings cards and mugs which relate to the law of attraction and the power of positive thought. The law of attraction, well documented in the best-selling “Secret” by Rhonda Byrne, encourages readers to send positive thoughts out to the universe and to be grateful every day for what they have. In return they will attract money, health, love and all good things they have always wished for. Gratitude Art is being launched to remind people to trust the universe and stay positive, without having to stick post-it notes all around their houses, or rely on cork-board messages to jog their memory. “Positive thought has completely changed my life, and the lives of those around me. It is only when we learn to be grateful for what we have and give thanks to the universe that we will receive good things in return. As a graphic designer I have been able to create a range of products to reflect the power of our thoughts to help us stay focused in our everyday life”, says Line Lyster, founder of Gratitude Art and owner of Redline Company in Marbella. This unique and exciting launch will take place on two different occasions and stores starting on the 9th April 2010 at Bookworld España, Guadalmina, between 13:00 and 15:00. As a consideration to those of you that work on Fridays, a second happening will take place at the Bookworld España in Puerto Banus on Saturday the 15th May at 13:00. The first fifty people at the launch will have the chance to write their desire on a sticker and send it out to the universe on a helium balloon. It is all about letting go and believing that the universe will respond. 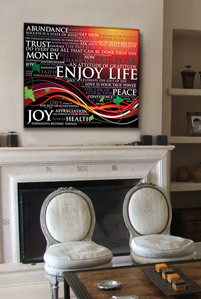 Guests will also have the chance to learn more about the Gratitude Art range of products. For more information about the Gratitude Art launch call +34 952 816 678 or email info@gratitudeart.com.